New digital cameras are being announced at staggering speed, and those of you who might be considering a new purchase may be slightly overwhelmed by the sheer number of options. 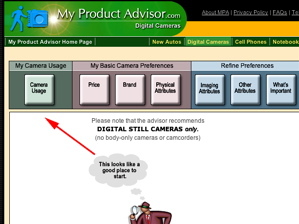 One way to start is by using the Digital Camera Advisor. This online tool allows you to enter personal preferences about a number of items and attributes, including camera usage, price, brand, and physical and imaging attributes. After you have made your entries, the site offers camera recommendations. To start, merely click one of the buttons and then move sliders or click checkboxes to indicate your choices. Unfortunately, the first button–camera usage–is one of the weaker pages, because the choices are so limited. You can choose between action scenes and landscapes, for example, but not nature shots or portraits. Still, take a stab and move forward. Many of the site’s other pages are useful. If you click physical attributes, for example, your attention is focused on camera size, display screen size, whether interchangeable lenses matter, and removable memory and battery types. These last two items allow you to choose formats that are compatible with existing equipment you might own. You can run through the pages pretty quickly. Then, before you get recommendations you see one final page that gives you a chance to stop and think about what’s most important to you. Is it the price? The brand? A zoom lens? 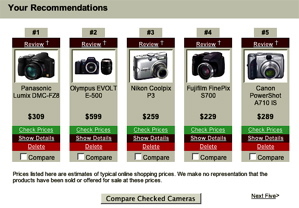 Finish this page, click “Recommendations” and you are shown a group of cameras. You can check their prices and compare them, but be aware that clicking for details triggers a screen that asks for anonymous demographic information, including your age and zip code. Personally, I consider that a small price to pay for using the site, but you may feel differently. Although this site is relatively simplistic and is surely not the final word on cameras, it does offer a good starting point. You can enter preferences so quickly and easily that you may decide to go through the site a few times, using different parameters each time. Whether you use this site’s recommendations or not, the screens help you identify and clarify what matters to you. That’s always the first step toward choosing a suitable camera.